Eidyllion’s History begins in April of 1999 when Samael and I (Salaí Ereshkigal) founded the band; we started to compose immediately, some months later we recorded our first album at Paul Bazile’s studio in Coyoacán; so we started to make public rehearsals with our friends until on January of 2000 we get into a rock contest and won the first prize in the metal category, then we started to have live performances in all the clubs and concert halls in Mexico City meanwhile we were knocking doors seeking a record label, some weeks later Dilemma Entertainment helped us to find a producer and Dilemma itself did the distro for the first two albums, so in August of 2000 our first album was released, since then we started to be a regular act at underground festivals. In 2001 that particular connection to the intellectual local scene was made, we were representatives of Mexico for two international festivals: Norway-Mexico cultural exchange and the San Pedro Atocpan International Folk Fest; as well we started the record of our second album Gymnopaidía del Leteo that was released on January of 2002, the gigs become more frequent since the album presentation, that tour lasted since January of 2002 to February of 2004, also we were support band for foreign bands in their Mexican shows, bands as Siebenbürgen, Madder Mortem, Lacrimas Profundere; was a very productive and enrichment period, meanwhile we were on tour we were composing for a third album, anyhow we took a six month break before starting the new recording. In November of 2004 we started to record our third album, on that time we decided to quit from the first producer due, the very common topic in Mexico of the never seen royalties; Anyhow we finished the album mix and released it on April 2005, by the time the doom metal and funeral black was very connected with the Gothic metal scene in Mexico, about 2005 that scene started to get cheap and cheesier so we took a different path: cultural festivals and gigs at Universities, was pretty satisfactory for us, in October of 2005 we won the ANCAI Musical Innovation award, we were invited to many universities, started to work with film makers, theatrical companies and performance artist, actually we had for three years a performer and choreographer in the lineup. This gigs lasted since April of 2005 to March of 2008. During that time we began a medieval repertoire, also we did 3 different shows focused on the very traditional Mexican Day of the Dead with our own songs and the support of different musicians, actors and photographers. In July of 2008 we recorded the EP ¡Viva Yo! This is a compilation of our compositions and arrangements for interdisciplinary works that began in 2005. After the launch Internet via in August we decided to take a break to focus on our other projects (solo projects, personal collaborations, books, etc). In 2010, we started the year with our first invitation to an international non-metal compilation, produced and distributed worldwide by Quickstar Productions (USA). We are currently working on the final details of our fourth album. Until now this is our history. Samael- He is the main composer also writes some lyrics from time to time; he makes all the music arrangements for the session musicians. He had studied piano and composition for years, anyhow he was fired from the National Conservatory because we were recording our second album, and a metal album was "not worthy enough for a conservatory student”. He also operates two solo projects: Grim Sköll and Dazhbog; during the last 5 years he had improved his skills as graphic designer and he works as freelance designer for various labels, bands, obviously he does the work for Eidyllion. 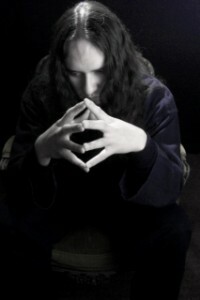 Salai - I’m the vocal, main lyricist and for now manager for the band; I had studied opera since I was 16, also I try to improve my technique not just at the classical way because I like to mix my classical skills with my metal performance. On the other side I’m a historian so many of my research topics are reflected in some lyrics for Eidyllion, as well the following album concerns to a three year research I made exclusively for. I’ve been studying art and esthetics on the last two years in order to help for my developing as the visual designer of the band. Besides Eidyllion we have a symphonic black metal band named Benatnash. Back in the day was pretty difficult to us to put a genre label on Eidyllion’s sound, so we decided to call our sound as Surrealista Natura Musica after all the main influences in our art: surrealism, we had dreamed and put it into sound and on the stage; Mother Nature, is our ideology and our path, the mother, everything; and Musica, we make music but not just as a way to mix sounds, we mix the energy among that sounds, the soul of the sound in order to try to create a new realm. In the beginning we were influenced by bands like Ulver, Arcturus, Evol, Troll, Darzamat, Dismal Euphony, Old Man’s Child, Samael, Ragnarok (UK), Behemoth added to our classic metal bands such as Metallica, Megadeth, Vixen, Warlock, Iron Maiden, King Diamond, etc. But meanwhile we were advancing through we had added musicians away from the metal scene as The Residents, The Tiger Lillies, The Mædieval Babes, Ataraxia, Ute Lemper, Azam Alí, Lila Downs, as well as other old and ancient sources we had found in the recent years. The reason is simple, if you want to open and maximize your musical taste but without quitting metal you should give us an ear, we play a particular mix between black metal, melodic elements, folk music and experimental sounds. On the other hand we have a unique vocal sound, a female making dramatic and light operatic voices, black metal guttural and classic rock style voice. Also our material is good way to perceive new and different sensations compared to the regular metal bands. We are influenced and involved by the natural spirits so it’s reflected on our music. For us Eidyllion is a journey to a mystical, epic and surrealist reality. We have 3 studio albums: Nashgaa (2000), Gymnopaidía del Leteo (2002) and Amorka (2005); one EP ¡Viva Yo! (2008) and various compilations launched in USA, Colombia and Mexico. Regularly we have a nice feedback from the specialized media; even our latest releases were very experimental and folk. Our first albums were well received and since then we have a good reception among people from different countries, specially people who is searching for bands whom sound is unique. Yes, we play live supported by session musicians, not so often as we used to due our current activities [we have a professional improvement nowadays, but is about to finish soon so we can retake our live activities with better chances and perspectives]. Besides the normal performance of an extreme metal band we are able to perform at cultural festivals with the support of performance artists, professional actors, dancers and acrobats or even just by ourselves; as well compose soundtracks for art expositions and short cuts, sometimes we perform those compositions live, that’s because our sound can be managed to catch a big spectrum of audience, a taste of this can be appreciated in our EP ¡Viva Yo!. Simply, if they want to try something new to promote and produce they should listen to us. Even the music is something unique, fresh, not said just by us, the band fans do and also by domestic and foreign press said so; we are not afraid to experiment making covers and versions, to find our sound into other composers and show it is becoming a nice exercise among these years, we can be crazy and make surreal stuff, yes, but still keep our mark, our metal sound and our style. Our motto is that as far as we learn is as far as our music can become, that’s why we are in constant improvement, in a permanent search for new sounds, new expectations for our creative activity. We can be directly understood because we handle a big spectrum of languages for writing lyrics: English, Spanish, French, ancient languages as: Latin, langue d’Oc, Langue d’Oil, ancient Castellan and Galician, these for our current work with medieval music; among other languages we work with like Mexican native languages. Besides our own sound and the high work ethic we handle for every part of our musical development, some years before I started to produce gigs with local bands under the name of Cytheron Prods, so since we decided to break the relationship with the former producer I started to expand the possibilities of the production house to a production and record label, so the mechanic was simple, is like Quinland Road for Loreena McKennit, we record, we produce and/ or co-produce and other label with better contacts make the distribution, until now it had been a good system, so we encourage the labels that would be interested in us to check this system, as well we are open to receive production and other advising because we always want to improve our products and music. We would like to see more interdisciplinary work in the metal scene, we are looking for that and by now Mexico is not open for, they’re still being very orthodox and the interdisciplinary work couldn’t be done because of the non professional skills of some elements involved, so I’m making an open invitation to foreign producers, promoters, zines, labels and artists. We would like to finish the pre production and start the recording for our next studio album, the one from the three year research; we have all the concept and the inlay design done, as well all the songs are ready to be recorded for the demo and then working for the final cuts. We expect to launch it besides a new distribution label, we are looking for one right now, and we are open to proposals. Also we are looking to re record the first two albums in order to have them available in stock due all the questions about their re issue after we had abandoned the former producer and was out of stock some months later. We had everything ready to record and all the art made so we are just waiting for a co producer and distributor for them. As well we are finishing a show for cultural stages here in Mexico. If you want the Amorka CD and other compilations you can ask for them at cytheron.prods@gmail.com, available worldwide by PayPal Payment and domestic sale by bank transfer.